Today's extended forecasts from the Climate Prediction Center continue to indicate cool and dry weather on average for the week leading up to and including Inauguration Day. January 20 is now included in the 6-10 day forecast, which calls for a 40-50% chance of below-average temperatures Jan. 16-20. In the longer range, the prediction for the 8-14 day interval Jan. 18-24 has the Mid Atlantic region well within a 50%+ area of below-average temperatures. For precipitation, the shorter-range forecast (Jan. 16-20, not shown) has near equal chances of above, near, or below-average precipitation. The longer range (Jan. 18-24) has at least a 40% probability of below-average precipitation. The individual 10-day model forecast for January 20 (read the caveats!) shows a warming trend following a strong cold outbreak in preceding days. If you're thinking about what to pack for a trip to the Inauguration in Washington, you might want to start looking for Click and Clack's proverbial Bronco Nagurski long underwear. January 20 is now smack dab in the middle of the 8-14 day extended forecast range. The latest forecast from the Climate Prediction Center, for the week of Jan. 17-23, shows an intensifying Arctic outbreak across the Mid Atlantic and Northeast. Although the core of the coldest air is forecast to remain to the north, from northeastern Pennsylvania across New York and into New England, the Washington region is expected to have a 50-60% chance of below average temperatures for the 7 days centered on Inauguration Day. For precipitation, probabilities are still 40%+ for drier than average conditions. For what it's worth, and not to be taken literally (read the caveats), the 11-day model forecast specifically for January 20 (bottom map on the right) shows a very cold air mass extending from eastern Canada southward along much of the East Coast. Today's extended outlook for the 8-14 day interval including Inauguration Day reverses a slight recent trend toward more seasonable temperatures. For the week Jan. 18-22, the predicted area of below-average temperatures has expanded to cover nearly the entire U.S. east of the Mississippi. Northern Virginia, the District of Columbia, and Maryland are now in the southern portion of an area with 50% or greater probability for temperatures below the climatological average. For precipitation, chances are still 40%+ for below-average amounts. Following up on yesterday's discussion of model limitations, this morning's 12-day model forecast for 7 am on January 20 shows a stunningly severe cold wave extending as far south as the Gulf Coast and northern Florida, along with frozen precipitation over much of the East Coast. This is a dramatic change from the much less intense cold outbreak and generally dry conditions over the Mid Atlantic area in the forecast from data collected just 24 hours earlier. As far as the model forecasts for the specific day are concerned, Climate Capitalists should humbly recall the immortal words of the late Louis Rukeyser, "At least some of them will be wrong." See the excellent comments by site visitor SteveT on why even the average range of model predictability is likely to be too optimistic in this case. Note: Yesterday's 1.26" of rain was just 0.07" short of the record for the date set in 1908. Why Don't We Have a Specific Forecast for Inauguration Day? You may have noticed that the discussion of the Inauguration Day weather outlook, at least so far, has been expressed only in terms of average probabilities for an entire week including the day of interest. 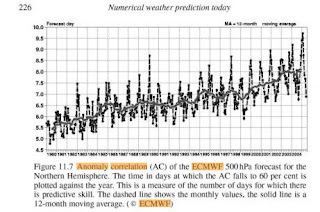 If climate predictions can be made with some confidence well into the remainder of the century, why can't we make an accurate weather forecast less than 2 weeks ahead? Early last year, we posted an analysis of the limits of daily weather forecasting. The upper chart to the right shows that there has been a steady increase in the skill of computer weather models, but there is essentially no value in a forecast beyond about 8 days. In spite of this, some current forecast models are routinely run out as far as 16 days. Is this just a waste of computer resources at taxpayer expense? No, it serves to generate a base of experience from which the models can continue to be improved in the future. Because the model output is available, however, snow freaks looking for the next school cancellation, commercial weather services looking to make a quick buck, and corporate media attempting to capture more eyeballs for their pop-up, animated, cycle-sucking advertising continue to peddle the notion that a forecast for a specific day at a particular location 2 weeks or more in advance makes sense. This is not only foolish, it's also unprofessional on the part of those meteorologists who enable such activity (despite their disclaimers and caveats), and it confuses a public already being bombarded by misinformation and even deliberate disinformation on the relationships among weather, climate, and policy issues. As an example, the 4 maps to the right are the computer model predictions for 7 am, January 20, 2009 made on each of the last 4 days (most recent at the top, oldest at the bottom). If you're not familiar with reading weather maps, the solid lines are surface air pressure, the green and blue shaded areas are precipitation, and the dashed red and blue lines are an indirect representation of temperature. You don't need to be a weatherman, however, to see that these are very different patterns. Images (click to enlarge): Weather model skill as a function of year, from The Emergence of Numerical Weather Prediction, Peter Lynch, Cambridge University Press, 2006. Chart © ECMWF. GFS model output maps for sea level pressure, 1000-500 mb thickness, and precipitation, 7 am, January 20, 2009, from NCEP/NWS/NOAA. The latest extended-range forecast from the Climate Prediction Center shows little change for the Washington, DC region. For the week of Jan. 15-21, ending the day after the Inauguration, the area of cool temperatures from the Great Lakes through the Mid Atlantic and Northeast has shrunk somewhat, but the probability of below-average conditions in the Nation's Capital area remains at 40%+. Likewise, the chance of lower than average precipitation is also still at 40%+. At 1:38 pm today, visitor number 10,000 since CapitalClimate split off in mid-2008 from CapitalWeather.com's sellout to corporate media arrived at this site. 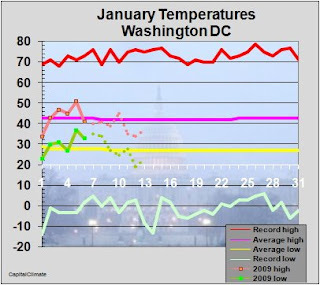 The 10,000th visit came from Washington, DC via verizon.net to view our Presidential Inauguration weather forecast. Thank you and all of our previous visitors for your interest in unfiltered reporting and commentary on weather, climate, and related policy issues. Please let us know in the Comments section what topics you would like to see covered in future posts. As was the case yesterday, the Washington, DC region remains on the edge of an area of 40%+ probability of cooler than average temperatures for the extended range. That 8-14 day range now ends on Inauguration Day, January 20. The probability is also 40%+ for below-average readings in the precipitation department. 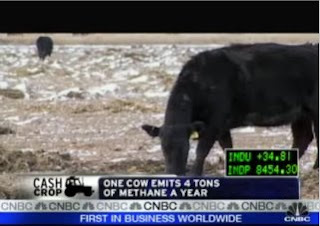 "A Carbon Tax For Animal Emissions - More Unintended Consequences Of Carbon Policy In The Guise Of Climate Policy"
"Getting Wind of a New Tax"
"EPA calls talk of a tax on cow flatulence a bunch of hot air"
"This is a great example of Internet viral folklore," he said. "But there’s not a whiff of truth." Today's extended forecast for the week ending the day before Inauguration, Jan 13-19, from the Climate Prediction Center shows the area of below-average temperatures continuing to shrink. The Washington, DC region remains just on the edge of the area for 40% or greater chances of cooler than average temperatures. For precipitation, most of the East Coast is still in the 40%+ category for below-average amounts. Looking back: The forecast made a week ago for the week starting tomorrow called for below-average temperatures in the region, and that appears likely to be correct. As of today, the 8-14 day extended forecast now includes the weekend preceding Inauguration Day. For the period Jan. 12-18, the computer-generated forecast shown above (human modified forecasts are made on weekdays) indicates a gradual shift eastward of the temperature pattern in earlier forecasts. The area of above-average temperatures has now moved into the Midwest from the West Coast, and the below-average area along the East Coast has shrunk. For the immediate Washington, DC region, chances are still given as 40% or higher that average temperatures for the week ending 2 days before the Inauguration will be below the climatological average. The precipitation outlook continues to show dry conditions for most of the U.S., with probabilities 50% or higher for below-average amounts in the Washington area.